The shape of digital signage solutions has long been defined by the rectangles we know from our own TVs. However, there are lots of new options to fit the shape and functional needs of today’s changing enterprise. For some businesses, eye-grabbing HD displays on store aisle endcaps may seem like a great idea, for example, except that’s oceanfront property for product in the retail business. A full-sized display would take up prime merchandising space. Putting the screen up above the product would seem like a reasonable workaround, but that’s above the natural line of sight for shoppers; would it get noticed? Full displays also present practical challenges in public spaces, like walkways and on mass transport vehicles. Those kinds of displays, in many situations, may drop down so far that people could bump their heads on them. These integration challenges have spurred the development of creative new digital signage solutions for getting messages in front of consumers in pragmatic ways. Stretched displays — full-sized LCDs cut in half horizontally — are one of the solutions addressing spacing challenges. Samsung offers a specialty 37-inch display that has all the connectors and capabilities of a full-sized display, but at half the height. Samsung’s SH37F, with its unusual 16:4.5 aspect ratio, can bolt onto the front of a retail shelf and allow product to be stocked above and below it. Its half-height also means it can give an endcap the impact of eye-catching, full-motion graphics and still be nested down with product, within the natural line of sight for shoppers. That skinny, stretched form factor also means that in walkways, they can emulate directional signs — high enough to not be a safety hazard but, but unlike printed material, networked and capable of being changed as often as is needed. 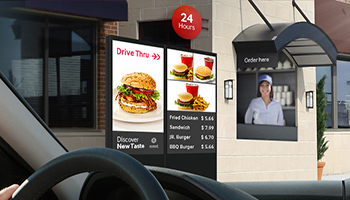 Explore the cost benefits of digital menu boards. Outdoor digital menu boards are enhancing the customer experience and providing huge cost savings. These digital wayfinding signs can have standard messaging, but also rotate through a series of messages that can direct people to multiple meetings and event locations, or show automatically triggered safety and directional messaging if there is a fire or other emergency within a mall or transportation hub. Advances in LCD technology have opened up new possibilities for digital signage solutions in vertical markets like apparel retailing. Fashion floor and dressing room mirrors, which have long been standard fixtures, can get a digital upgrade with mirrors that double as displays, and use content pop-ups that improve the shopper experience. Rent the Runway is among several leading brands piloting their use in store. Samsung’s MLE mirror displays, available in 32″ or 55″, can be tuned to the needs of retailers. The displays use a polarized film that ensures the displays can function as a conventional mirror, a digital sign, or most interestingly, as both. These displays allow shoppers to check out how they look with garments, while content pops up on the edges to inform them of store promotions and new products. Tied in with a content management system and married to sensors, these displays can run content specifically tailored to the person using the technology. For example, an IoT-enabled sensor can detect what items are being tried on (perhaps using RFID tags on the garments) and then showcase complementary items like scarves and handbags, or alternative colors for the items. Mirror displays also have big possibilities in the hospitality sector. Few people look through the binders left on hotel room desks that tell guests about services, but just about everyone looks at the mirror in the hotel hallway, which can double as a marketing engine to tell guests about available services, such as spas or room service meals. Mapped to room management systems, they can be customized to each guest — welcoming, instructing and reminding them of certain information or events, and upselling on things like late checkouts or drink specials in the lobby bar. The display business has been infatuated for years with making LCD screens ever larger, but there’s also a solid market out there for small displays — from electronic, e-paper shelf labels that replace conventional price tags, to 10-inch smart signage displays that help end the frustrations, conflict and general chaos of managing meeting rooms in typical medium to large office spaces. Mapped to meeting room management software or tied to the organization’s email and calendar system, these 10-inch signs at meeting room doorways put an end to rooms being occupied by groups who didn’t book them, and let anyone who cares know, at a glance, what rooms are free and when, as well as what rooms are booked, by who and for what. The signs ship with built-in media players. Software platforms are even color-coding the content to display red if a room is busy and green if free, so someone across an office floor can gauge availability without needing to check the room. With the ability to program custom content, these small signs are also suited for shelf-edges in retail, or check-in and service counters for everything from dentists and hair salons to hotels and car rental outlets. As today’s businesses environment moves in an increasingly digital direction, signage is evolving to be more efficient and effective for passersby, helping them make informed decisions in specialized industries from retail to hospitality and beyond.